The new Classic Performance Products' power steering kit for 1960-'66 Chevy trucks provides the needed mounting hardware for you to install a 1969-'87 2wd, Chevy truck power steering gearbox. The finished assembly is geometrically proper and works just like a late-model truck. 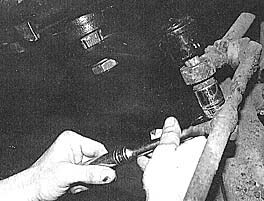 If you are an owner of a 1960-'66 Chevy truck, you probably have wondered, at some time or another, what it would be like to have power steering. Of course, the hard-core custom truck fabricator will always be able to design something that will work using any number of products. But, something like that is indirect and more of a personal touch. 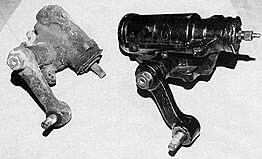 There have been a few folks who have made attempts to create a good kit that will provide 1960-'66 Chevy truck owners with power steering using GM parts. 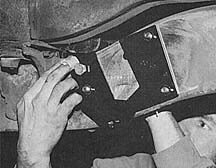 But, no one could come up with a kit that was as simple as one-two-three to install, as well as being engineered properly and safely. Classic Performance Products' new power steering kit is definitely what you 1960-'66 Chevy truck owners have been looking for. It is very easy to install in a short amount of time. Besides being geometrically correct, the kit also installs a little backbone other kits don't offer by providing a backing plate that installs on the inside of the frame. 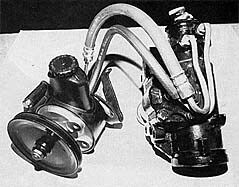 Well, as you would expect, the engineering minds at Classic Performance Products have designed, engineered, tested and are now producing a 1960-'66 Chevy truck power steering kit that is so perfect and easy to install, it almost doesn't seem logical that a truck this old can have power steering so easily. 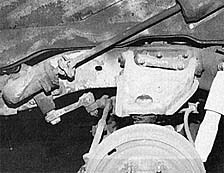 The kit includes two custom-made mounting brackets which attach on both sides of the driver's side front frame to locate the GM Saginaw power steering gearbox in nearly an identical location as you would find on a later model Chevy truck. The outer mounting bracket features the required mounting holes with welded-on spacers to position the gearbox in a straight line with the steering column. Also included in the Classic Performance Products power steering kit are the required grade-eight hardware for mounting the brackets, and a steel sleeve that will connect the steering column shaft back together after it has been shortened. A one-half inch section of angle iron is also included to ensure that you have something to make a straight line with. Not included in this kit is the actual 1969-'87 2wd, half-ton Chevy truck gearbox, hoses and power steering pump. You are required to provide these items while the kit allows you to install them with ease. 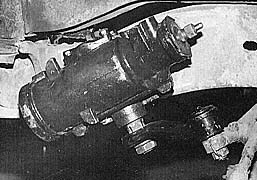 When choosing your power steering gearbox, make sure that it is a 1969-'87 2wd half-ton truck model. Take note of exactly what year box you have because in 1976, Chevy changed to metric fittings on all its power steering units. This way you will. be able to get the proper power steering hose kit from your local parts supplier. It is best to match up the power steering pump to the model of box and hoses you have to make the installation that much easier, You will also need to acquire a new ragjoint or steering coupler. If you are getting a used gearbox, get the ragjoint that was originally attached. If you are buying everything new, then get a rag joint of the same year. 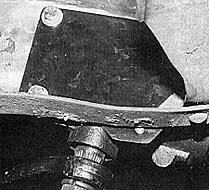 For both the used or new joints, it is very important that you keep the two mounting bolts that conned thejoint to the steering shaft collar. These are shoulder bolts and they prevent the installer from overtightening the ragjoint during assembly. This is what the C.P.P. kit consists of. An outer frame mounting bracket with the proper holes and gearbox spacers to line the box up with the steering column. The other plate is to add more reinforcement to the mounting system that is assembled with grade-eight hardware. You must come up with the 1969-'87 2wd half-ton Chevy truck power steering box and pitman arm, matching hose kit and power steering pump. Take note of exactly what year box you have so that you can get the same year hose kit and power steering pump from your local parts supplier. In 1976, Chevy changed the gearbox fitting to metric. Aside from maybe the heavy accumulation of dirt and grease, this is what your stock, manual steering assembly looks like. 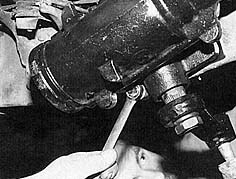 Obviously the first thing to do after you have properly jacked the truck up and secured it with sturdy stands, is to remove the old stock gearbox and pitman arm. 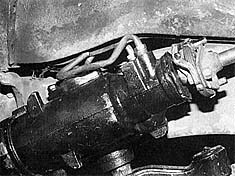 There is a dramatic size difference between the stock manual and Saginaw power steering gearboxes. Make sure that you have the right pitman arm to go with your box. To make sure that you scribe a straight line, C.P.P. 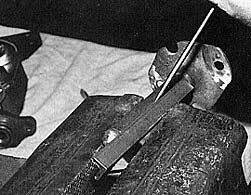 has included a one-half-inch section of angle iron that is to be used to make a line as shown. This will keep the correct timing of the shaft after it is cut. 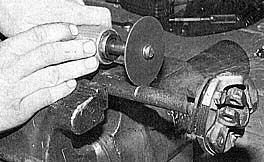 Use a cutting wheel to cut the steering shaft approximately six inches up from the rag joint coupler. 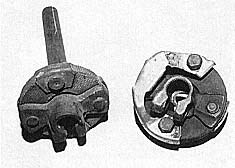 The stock rag joint coupler on the left is assembled with rivets which must be ground away to take the coupler apart. The new rag joint coupler is assembled with shoulder bolts which you should have gotten when you got the joint. 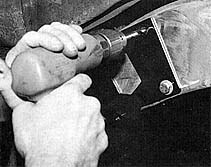 Because of the odd angle in which the rivets are placed, an air cutting wheel is used to cut the head of the rivet off. 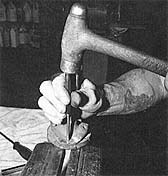 A hole punch and hammer will knock out the rest of the remaining rivet. 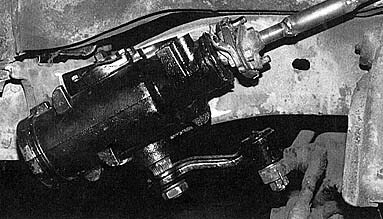 One of the shoulder bolts from the new power steering rag joint coupler is bigger in diameter than the stock coupler collar holes. You must make one of the holes bigger, which is easily done with a drill. 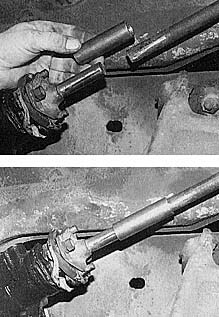 There is a visible difference between the old manual rag joint and a newer version for the power steering gearbox. Remember to get the same joint that came with your box or a new one of the same year. 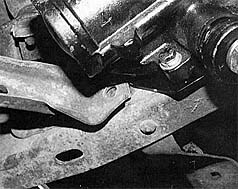 Bolt the rag joint coupler to the stock steering collar that you cut from the steering shaft using the shoulder bolts. Back over to the truck, clean up the frame a little around the area that you will be working on. 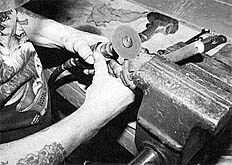 A disc sander will usually work best. As you will notice, there are factory holes in the frame already, two of which the C.P.P. kit uses. Install the outer mounting bracket as shown by inserting a bolt in the upper left hole and lower right hole. These are the factory holes which are used to position the bracket so that you can drill the two other required holes. When you have the new holes drilled, reverse the bolts so that they are inserted from the inside of the frame. 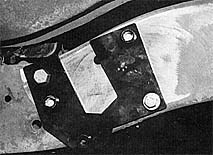 Three of the bolts extend outward as shown. The upper left hand bolt is still a bracket locater bolt so it remains installed from the outside. Also, take note of the lower hole that meets at the bottom of the frame. This hole is threaded because there is no frame to drill through. The matching mounting hole on the gearbox that meets the lower bracket hole now must be drilled out. The other holes on the box remain threaded. The drilled hole will have the mounting bolt inserted from the outside rather than from the inside of the frame. With a helping hand on the inside of the frame, holding the three mounting bolts that are installed from the inside, install the power steering gearbox. 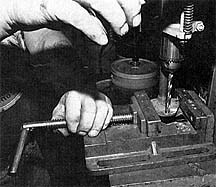 While someone tightens the inner bolts into the gearbox, notice that the lower hole that you drilled out secures a bolt that is installed from the outside of the frame into the threaded bracket. 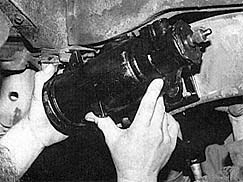 When the gearbox is mounted, recheck all the bolts to make sure they are tight. Also, now you can see just how great this kit is by the looks of the sturdy reinforcement backing plate. Now, install the pitman arm onto the drag link and tighten appropriately. 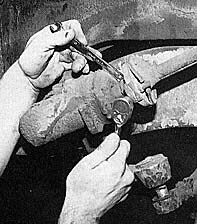 Don't forget to install a cotter pin for safety. At this point, this is what you should have. Classic Performance Products even includes a one-half-inch section of angle iron that is used to help you scribe an alignment mark on the steering shaft. 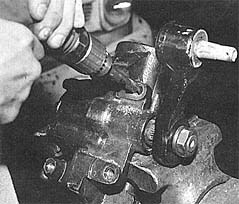 Take the six-inch shaft that you cut off with the collared end and loosely install it onto the gearbox. Roughly two inches must be cut off the shaft. 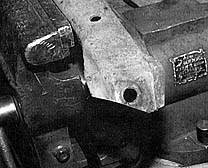 Install the shaft end into a vise and cut it with a cutting wheel on the mark you made. 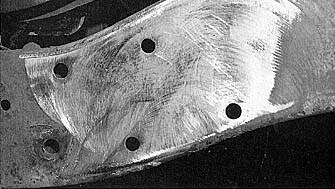 Both ends of the slip collar are to be completely welded all the way around. 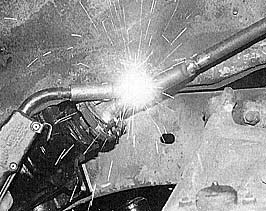 It is very important that the welder ground be attached ONLY to the steering shaft. If you attach the ground to the frame, the bearings in the gearbox will arc. 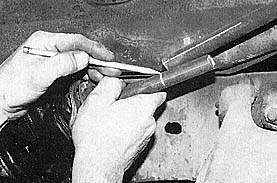 When installing the hose kit, you may have to trim away a very small portion of the inner fender lip for the hardlines to pass under it without obstruction. 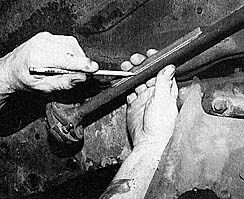 The last modification to perform is on the left hand bumper bracket. Because of interference from the gearbox plate, the bumper bracket will no longer install properly. 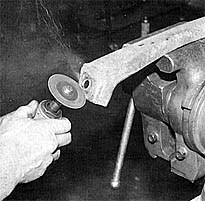 Use a cutting wheel to remove the upper corner of the bracket so that the bolt hole once again lines up with the frame hole.